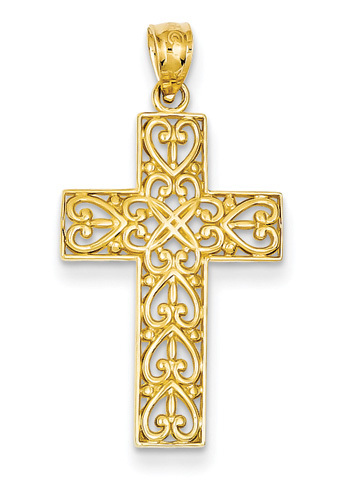 Celtic heart cross pendant crafted in 14k yellow gold with an intricate weaved filigree pattern. Heart cross pendant measures approx. 15/16" tall (1 3/16" tall with hoop/bail) x 5/8" wide. "For this is the message that you heard from the beginning, that we should love one another" (1 John 3:11). We guarantee our Celtic Heart Cross Pendant, 14K Gold to be high quality, authentic jewelry, as described above.